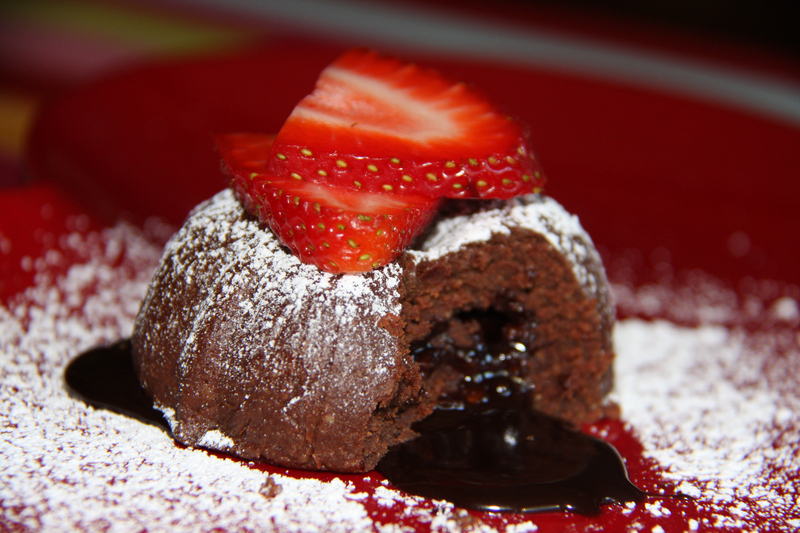 In daily life we really do want to minimize / eliminate sweets, but who can resist a little chocolate on Valentine’s Day? 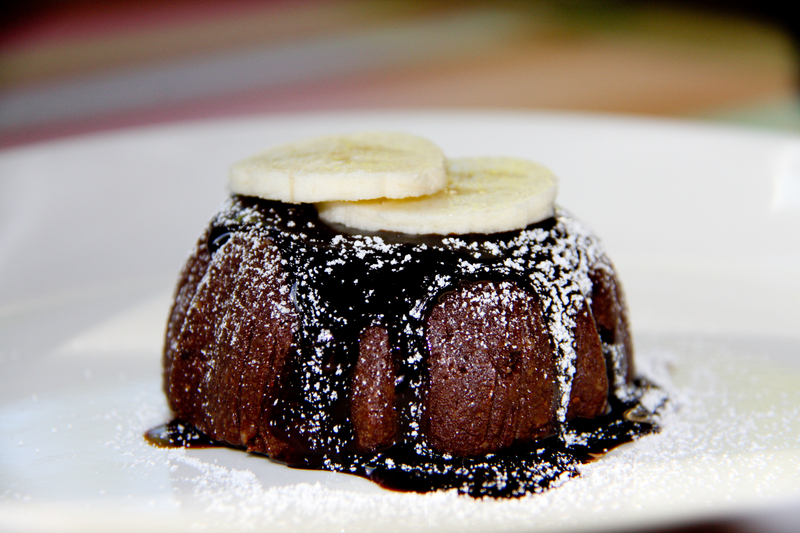 Make this raw molten cake with peanut butter lava for your honey and I guarantee they will be feeling the love. 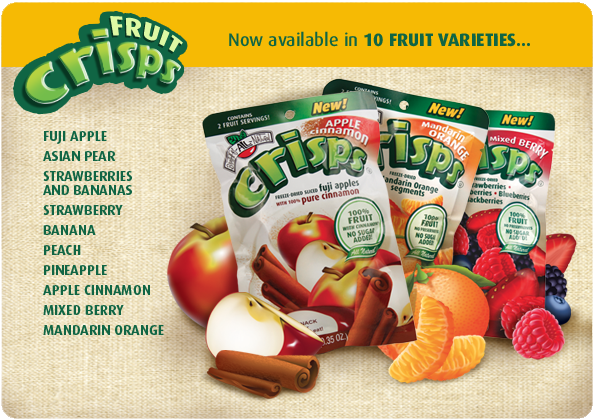 This is sooooooo yum! 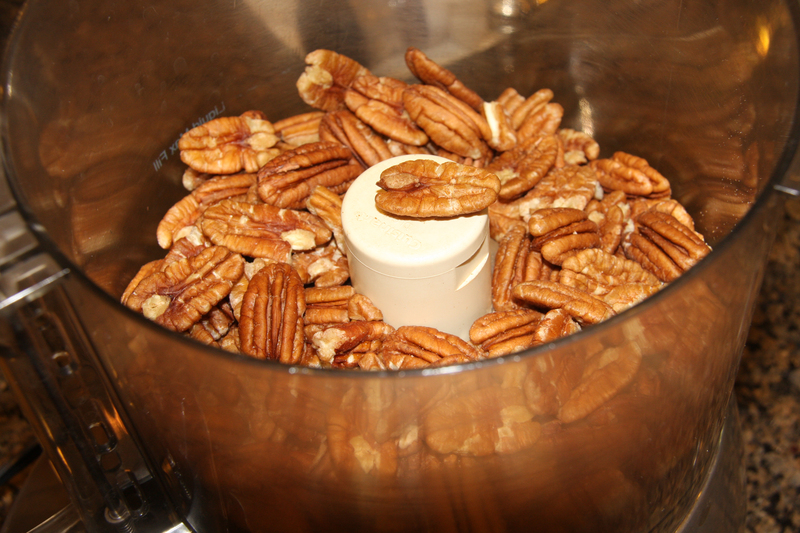 Take the frozen pecans and place them in the food processor (I use a Cuisinart I purchased at Costco). Turn on the processor and process until the nuts become meal. 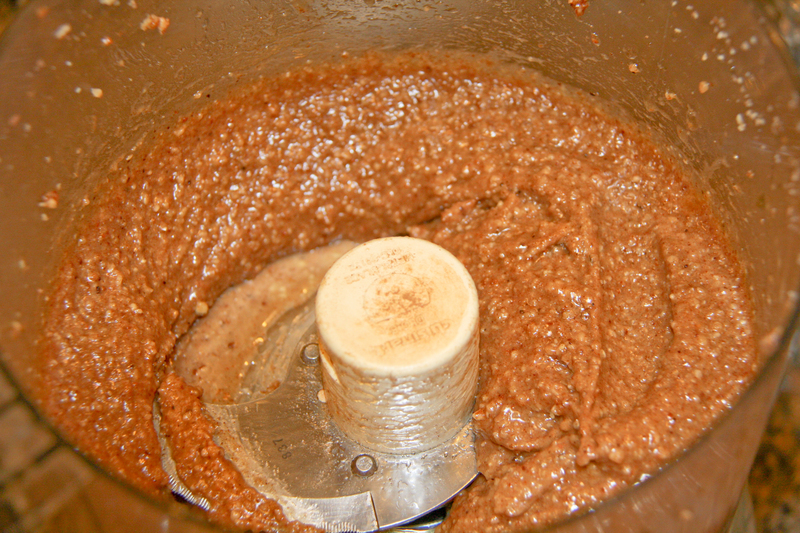 Do not process too long or it will turn into nut butter. Pour the raw agave into the nuts while processing. The nuts and agave will turn into batter. 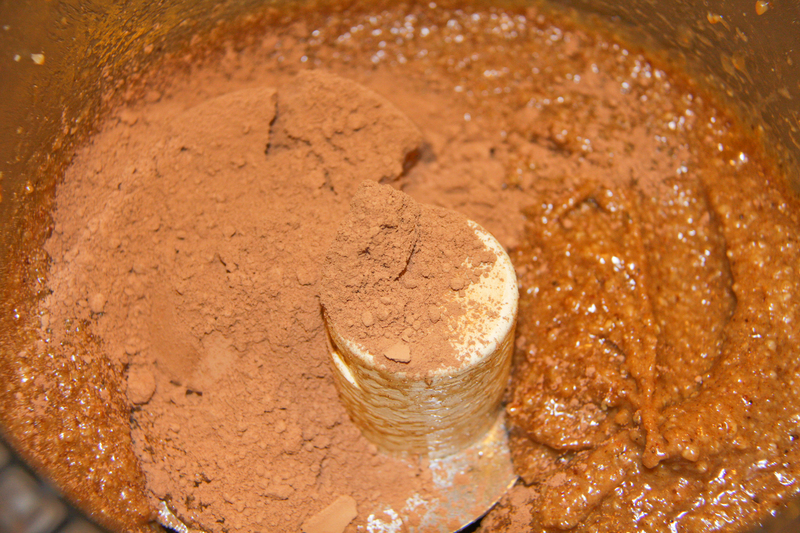 Add the raw cacao and process to incorporate. The processor will begin working very hard…you may have to stop and scrape down the bowl. 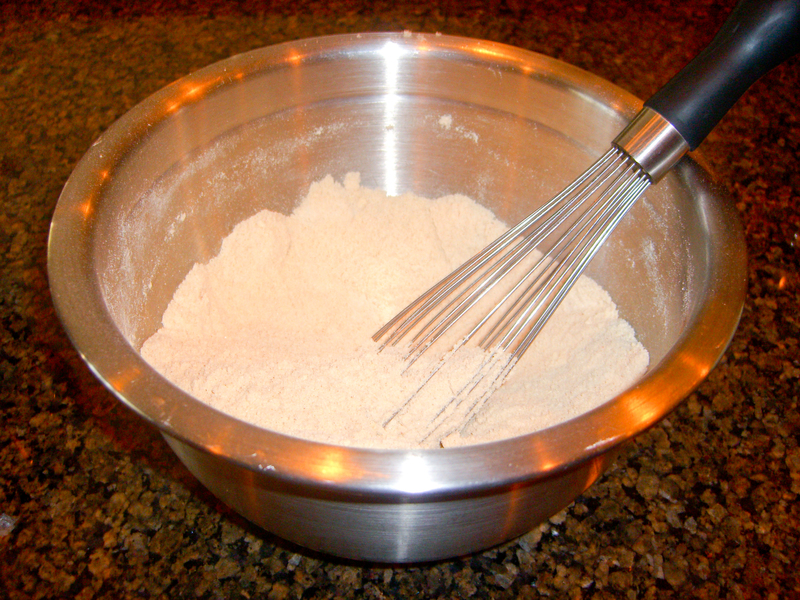 When well mixed, take the batter out and transfer it to a bowl. 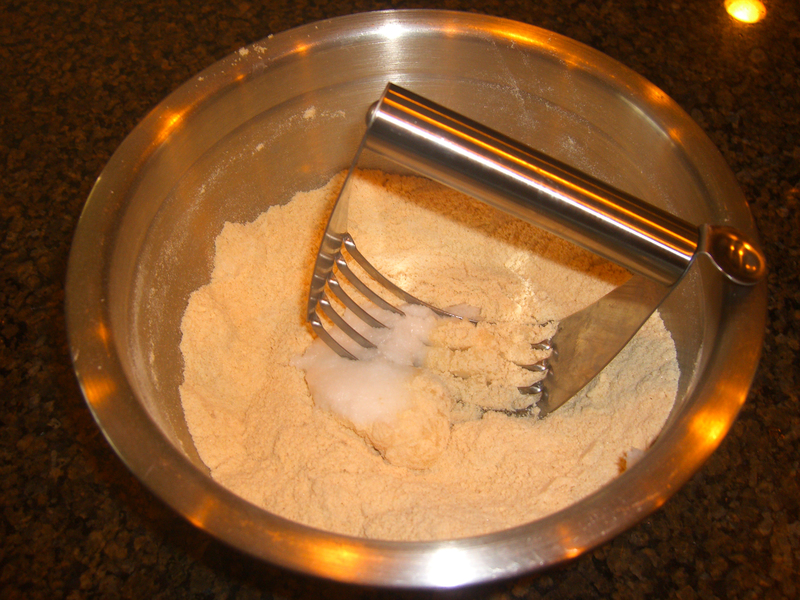 Wearing latex-type gloves (to avoid sticking), mix in the coconut flour with your hands. 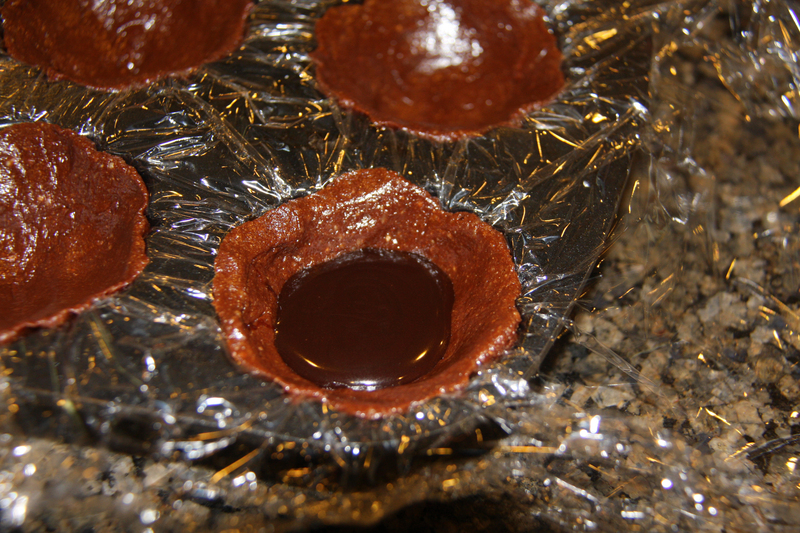 Line your mini cake molds with saran wrap. 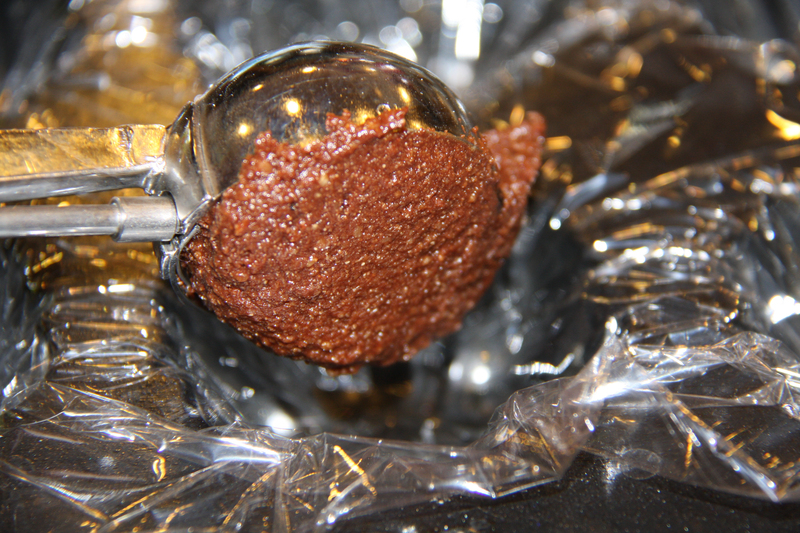 Once mixed well, use a 2 Tbs. ice cream scoop to fill each of the 6 molds. 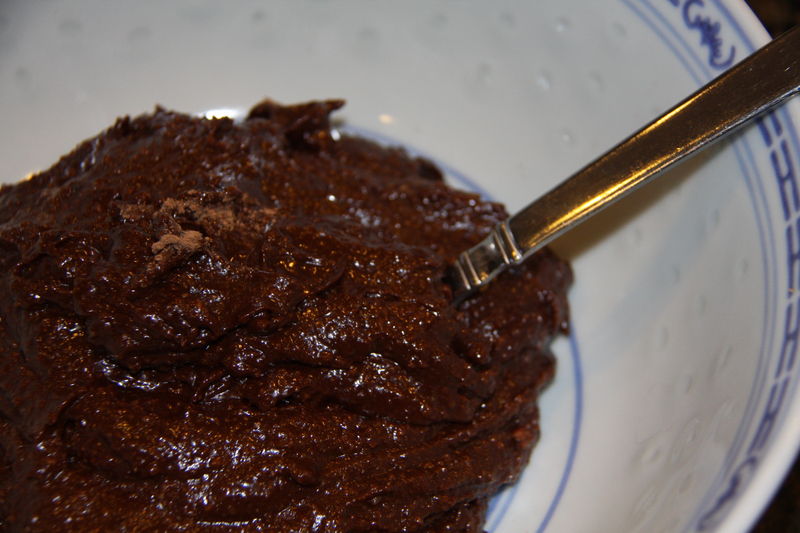 Wrap the remaining cacao batter in Saran Wrap and place it as well as the filled molds in the fridge for 30 minutes to harden. 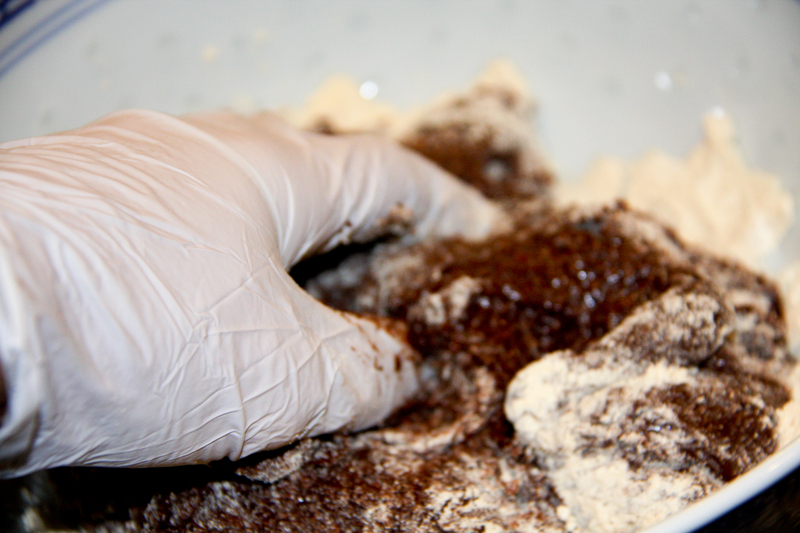 Once hardened take the molds out and wearing gloves press the batter into the molds making a well in the middle. 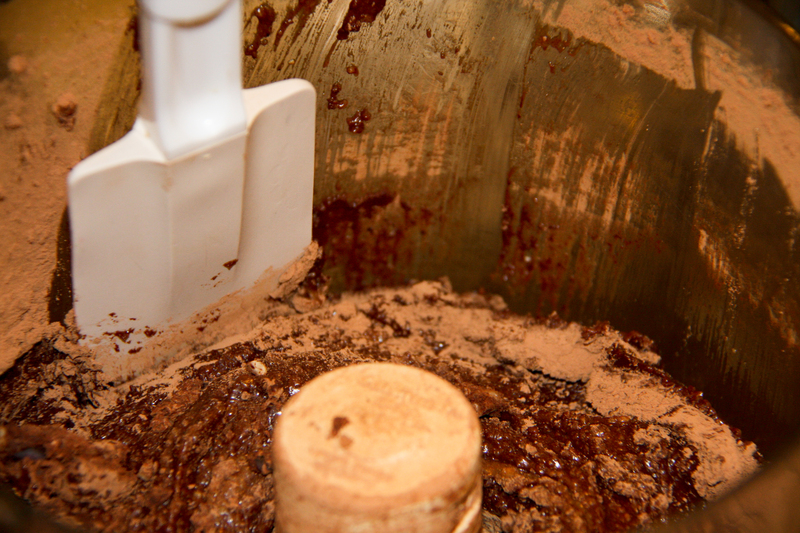 Make sure you spread the cacao mixture as evenly as possible so it dehydrates evenly. Fill the wells with 1 Tbs. 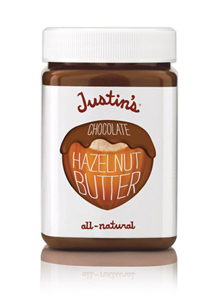 of organic peanut butter (or chocolate sauce). 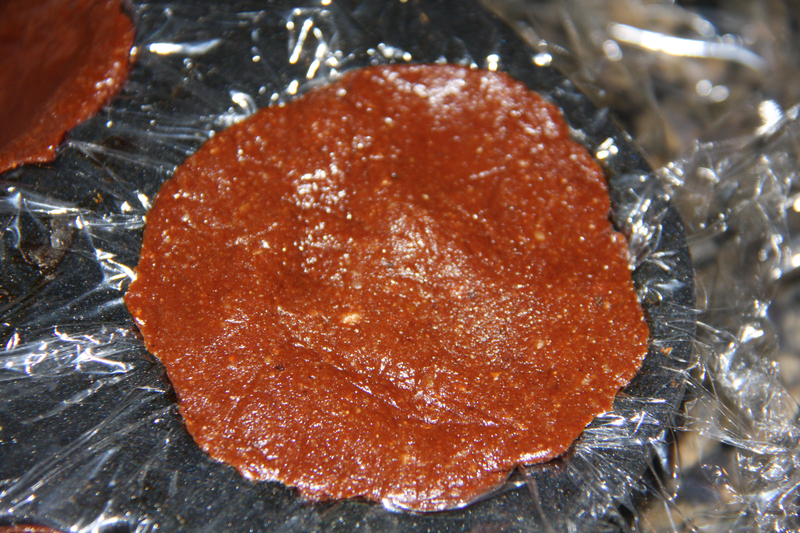 Take the remaining batter that was in plastic wrap out of the fridge and pinch off enough (approx. 1 Tbs.) to make a disc that will cover the bottom of each PB filled mold. Gently press the disc onto the bottom of the filled cakes. Put the cakes in the fridge for another hour to harden. Keep the cakes in the fridge until 2 hours before you plan on serving them. 2 hours before serving time place the cakes on your dehydrator’s mesh tray and dehydrate for 2 hours (It takes longer than that for the Excalibur dehydrator get to 115°, so rest assured those enzymes will still be alive and kicking). 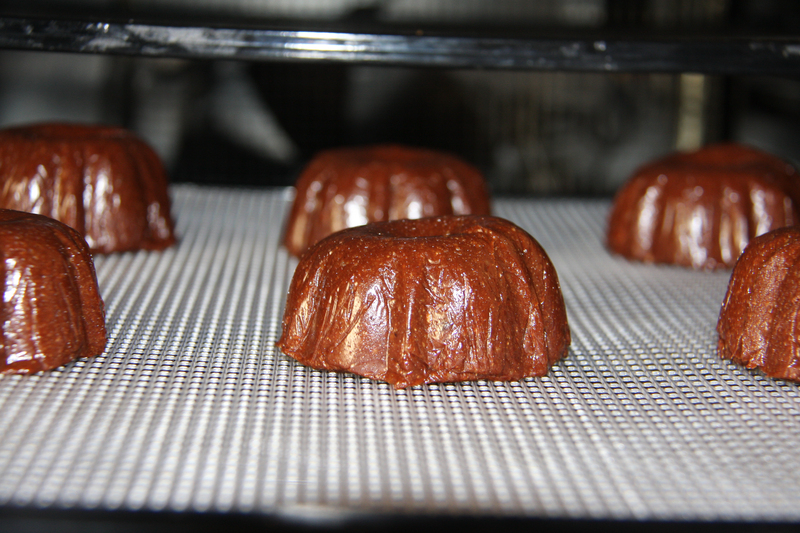 When the 2 hours is up you will notice that the cakes are no longer shiny, they will look matte as if they have been cooked. 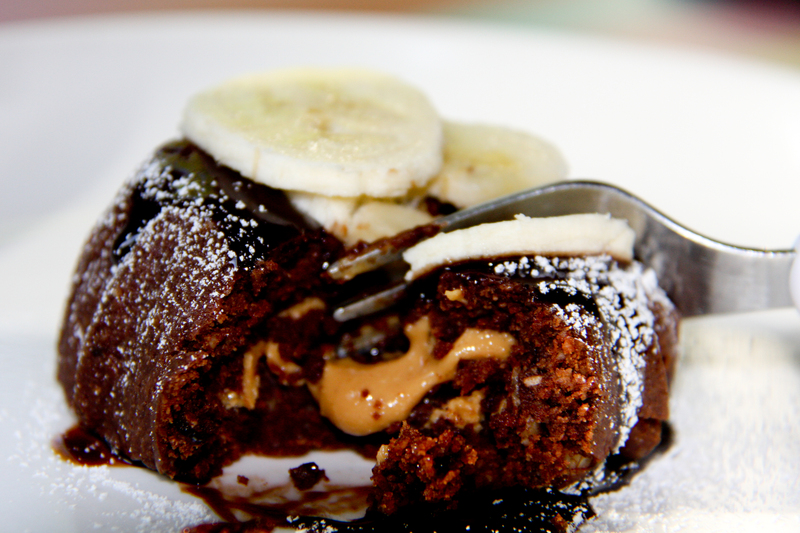 Top each cake with some chocolate sauce, a very thin sprinkling of organic powdered sugar, and sliced bananas. 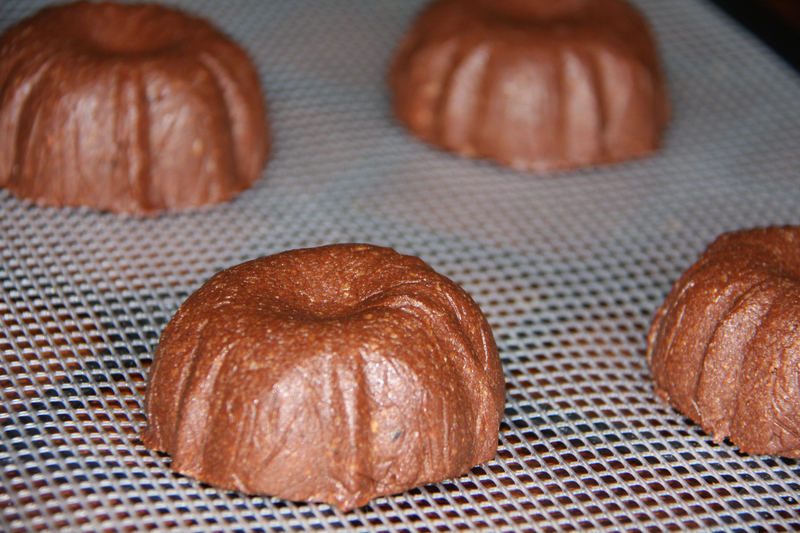 Serve IMMEDIATELY since these cakes are best warm…it will allow the peanut butter to ooze out when cut into. I also made an all chocolate version using the Fun Fresh Foods chocolate agave nectar as the filling…topped with powdered sugar and strawberries! 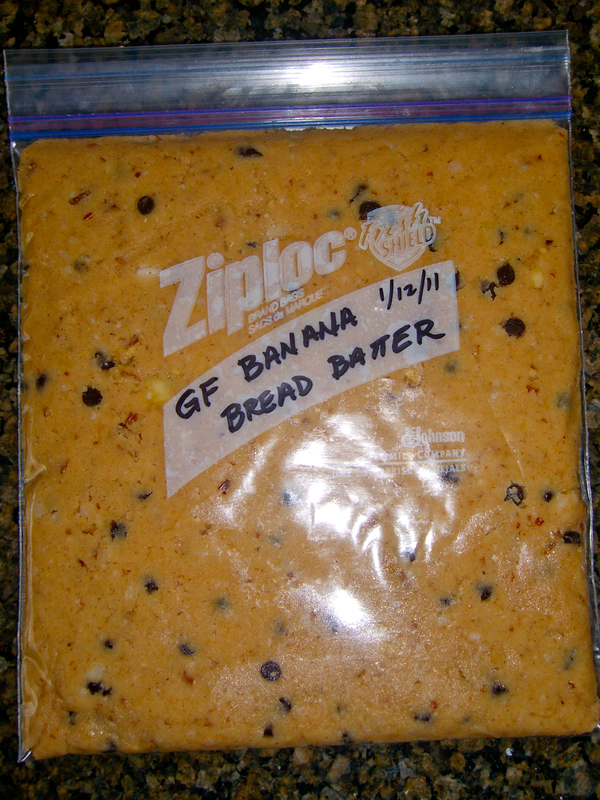 Our family eats a lot of bananas, but ever so often a few get to the point where my kids find them too ripe to eat plain… I then know it is time to whip-up some banana bread (click here to see another use for ripe bananas). This recipe has been my tried and true recipe for a while. 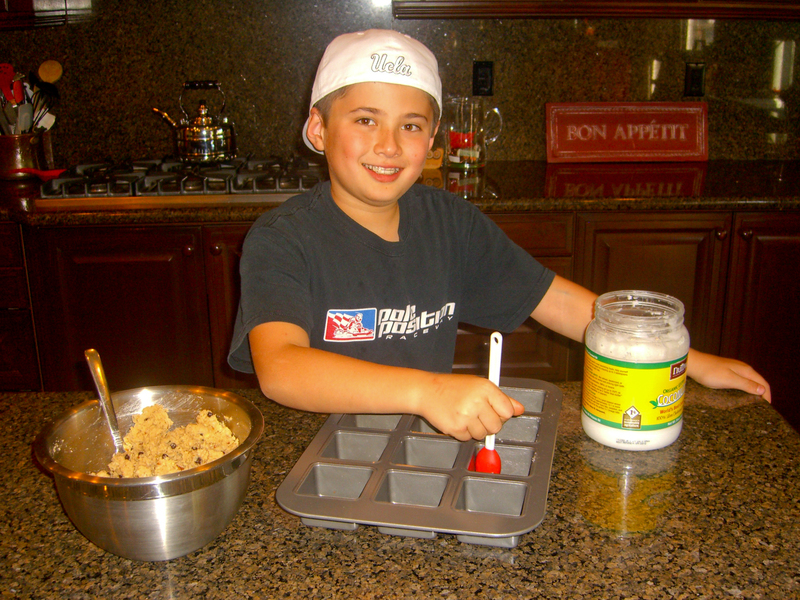 My daughter has a wheat allergy, so a few years ago I began experimenting with alternative flours. 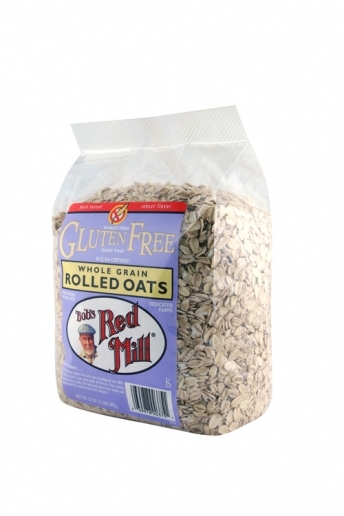 I know I have a winning recipe when my husband (who does not have a wheat allergy) gives them the thumbs up. 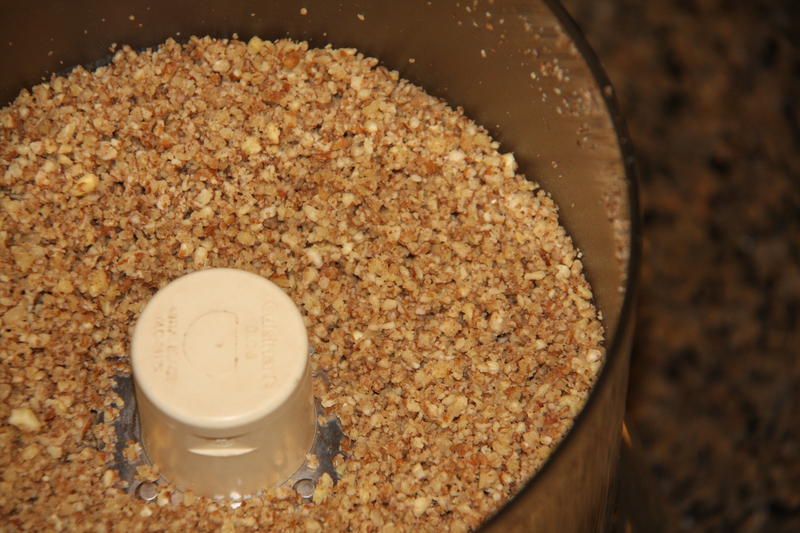 This recipe tends to be healthier than most because it uses nut flours as the base (coconut and almond) which are much lower on the glycemic index than regular flours. I also do not use sugar in this recipe. 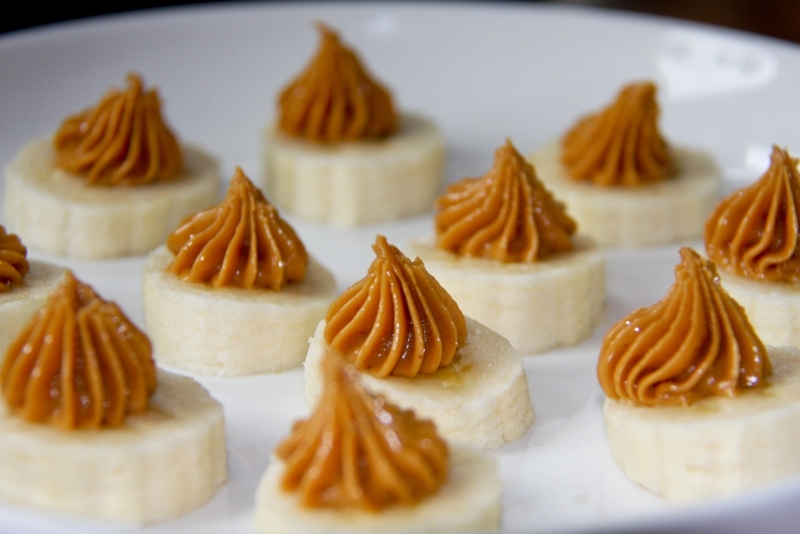 The bananas in themselves are very sweet since they are so ripe. I do add some Somersweet (which was created by Suzanne Somers). 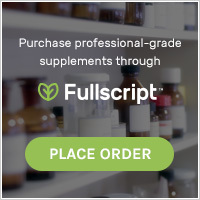 Somersweet uses inulin which comes from chicory and is a pre-biotic. 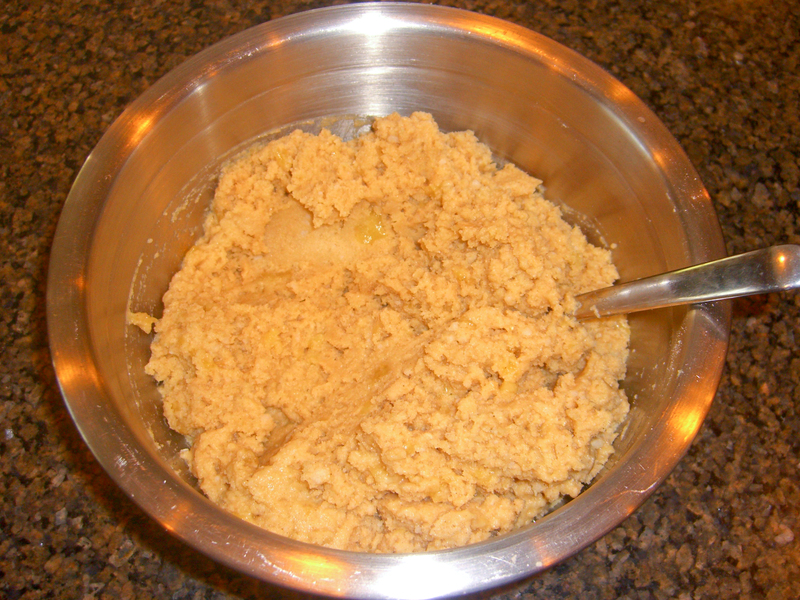 If you do not have Somersweet on hand, you can substitute sugar (coconut sugar or brown sugar). Coconut oil is also a very beneficial and nutritious. 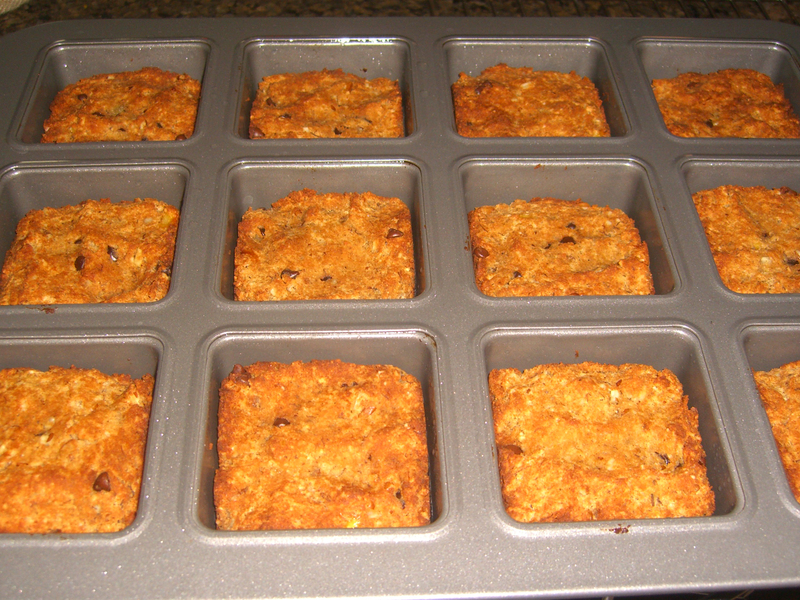 Grease the bottom and sides of your muffin tins with coconut oil (I use a mini crumb cake pan). 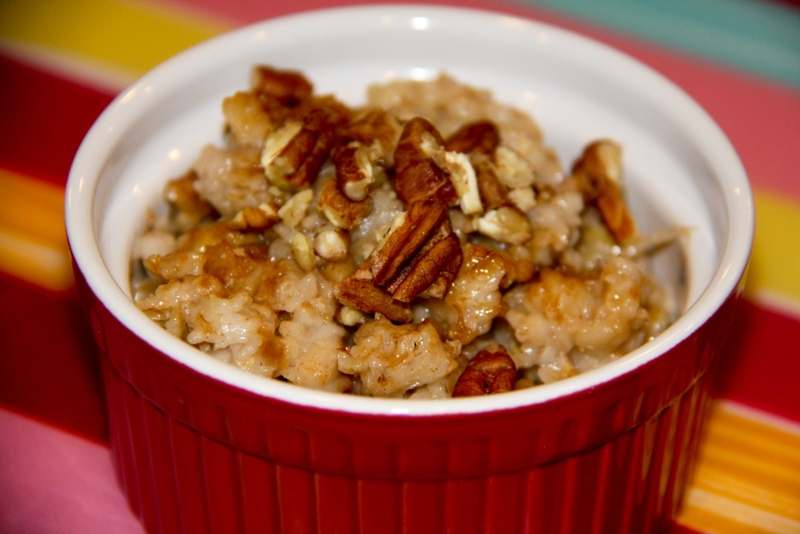 Combine all of the dry ingredients (except for the coconut oil, pecans, and chocolate chips) in a bowl and whisk them to incorporate. 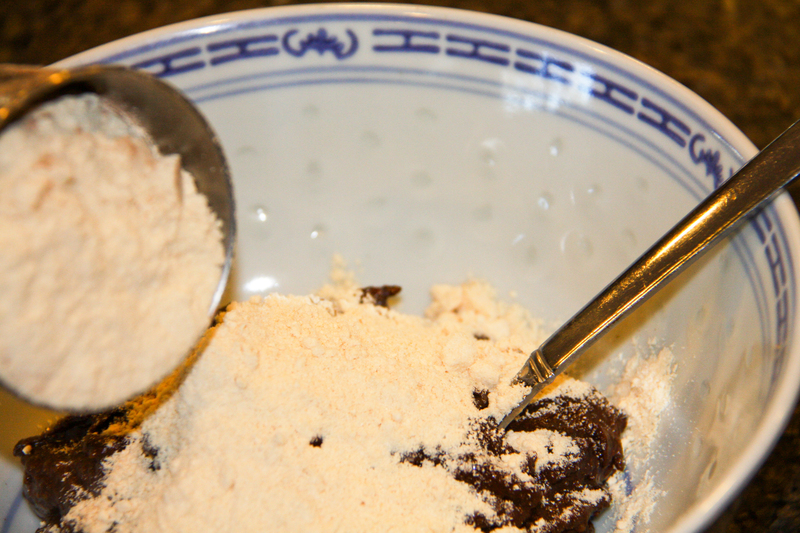 Once the dry ingredients are well mixed, add the coconut oil into the mixture and cut it in with a pastry blender. You want the coconut oil to break into lots of tiny pieces so that when you add the wet ingredients you won’t have large chunks of coconut oil throughout your batter (this step is very important). 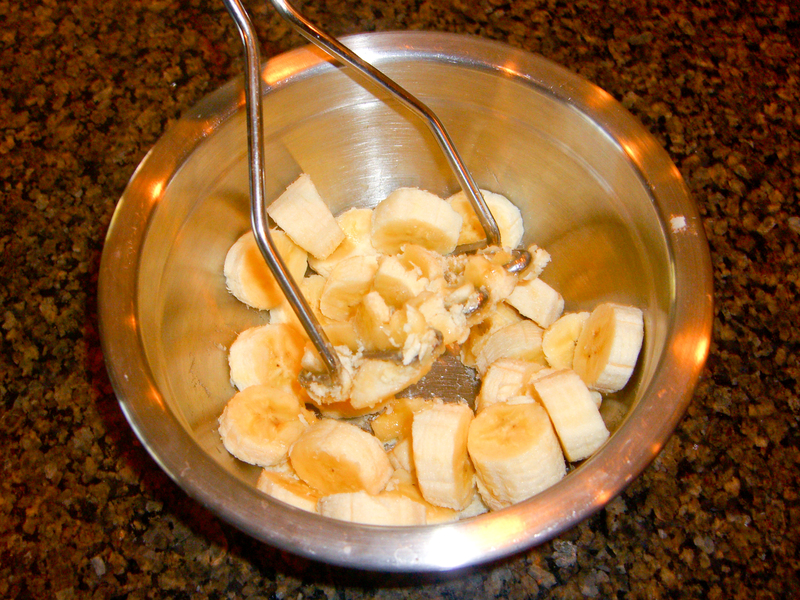 Slice the bananas into a separate bowl and then mash them being sure to leave some chunks. 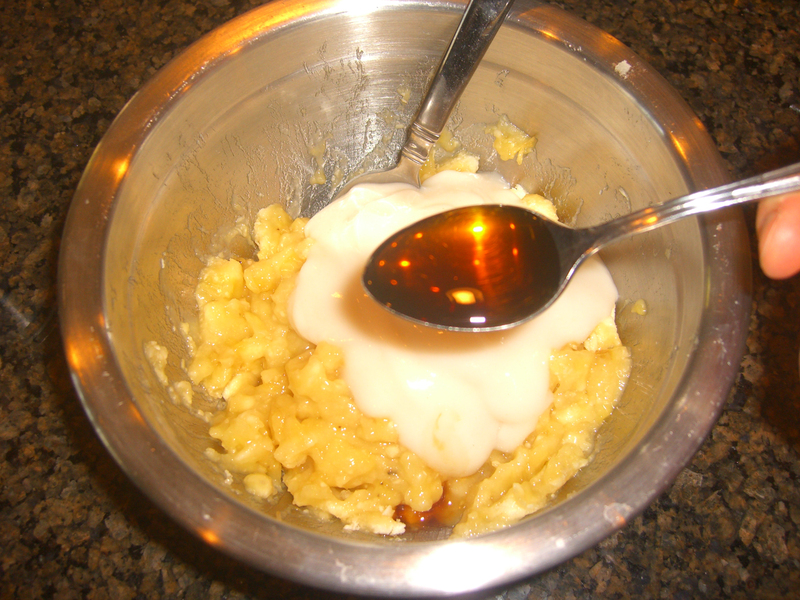 Add the rest of the wet ingredients into the bowl with the bananas and mix well. Next combine the wet ingredients with the dry and mix to combine. 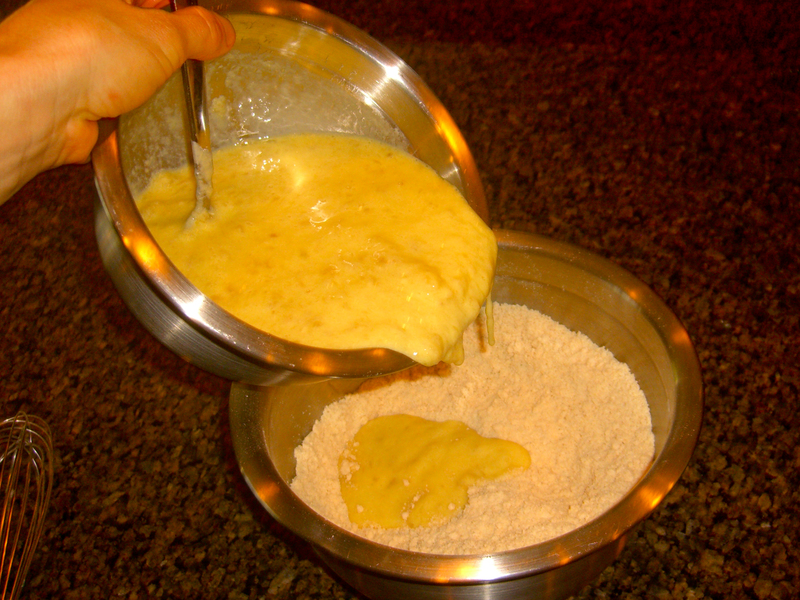 The batter will not be runny, but will hold together fairly well. 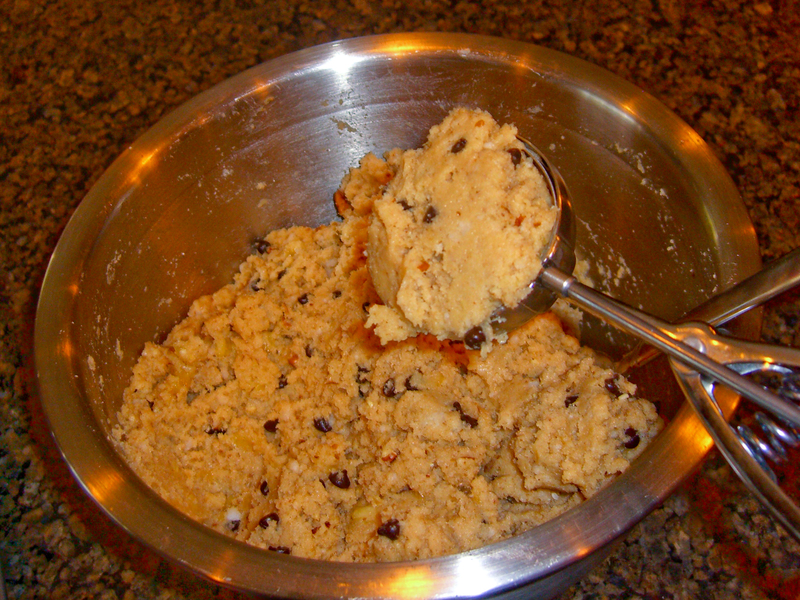 Once the batter is fully mixed, add in the pecans and chocolate chips. 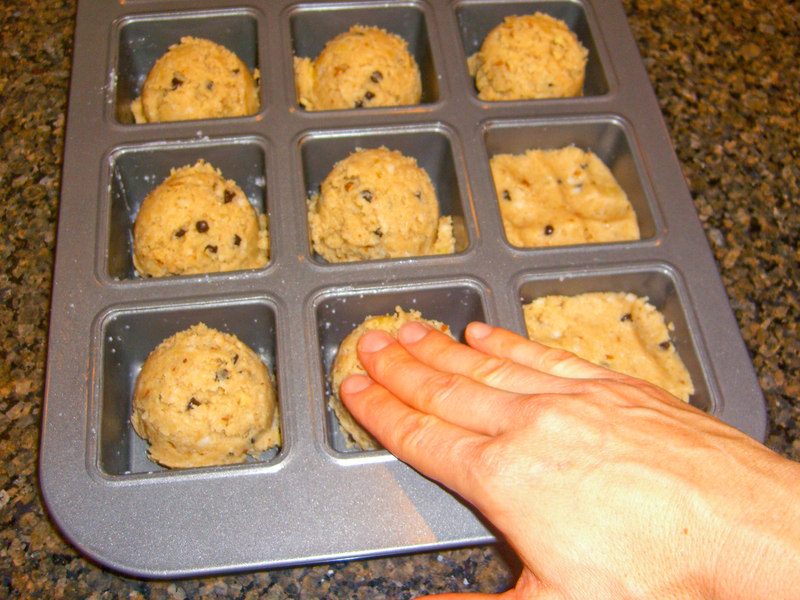 I use an ice cream scoop (approximately 1/3 cup) to fill my muffin tins and make them uniform so they cook evenly. 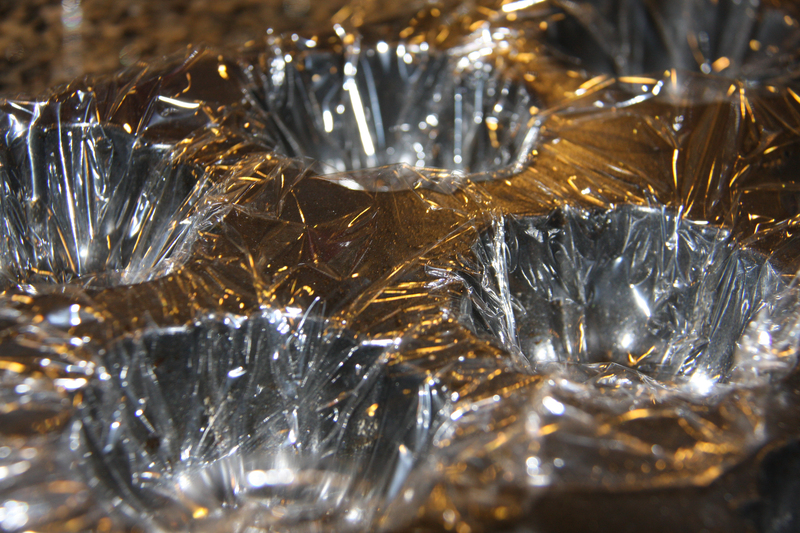 Once you have filled the muffin tins, push them down to flatten. 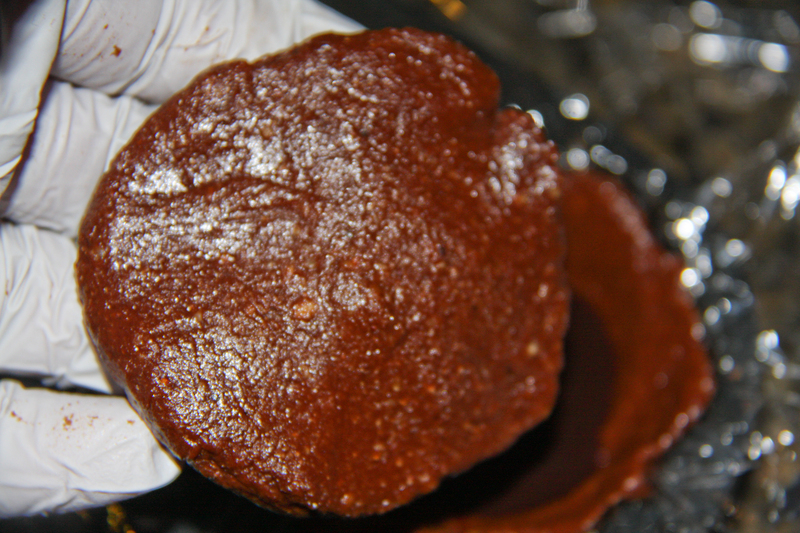 If you have any remaining batter, put it into a zip lock bag, flatten it, and remove all of the air bubbles. This batter freezes well. 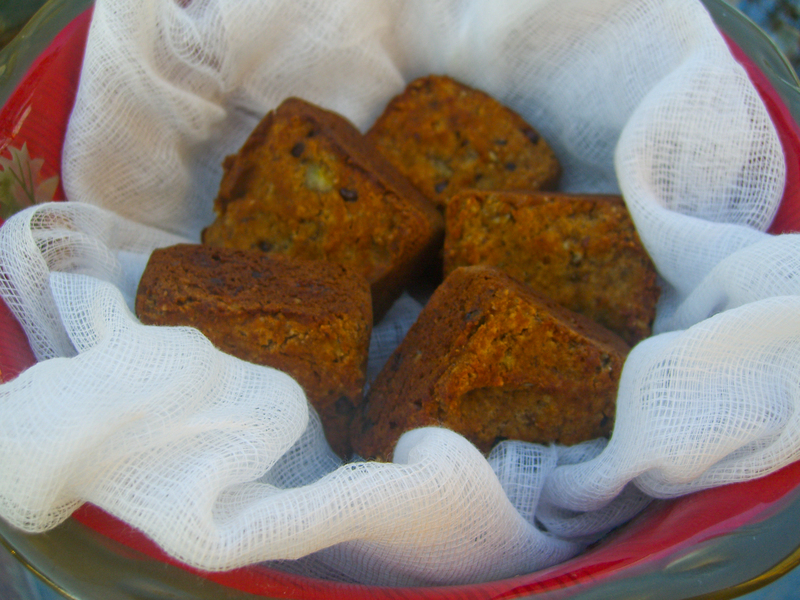 Bake the muffins for 30-40 minutes (depending upon your muffin tin). 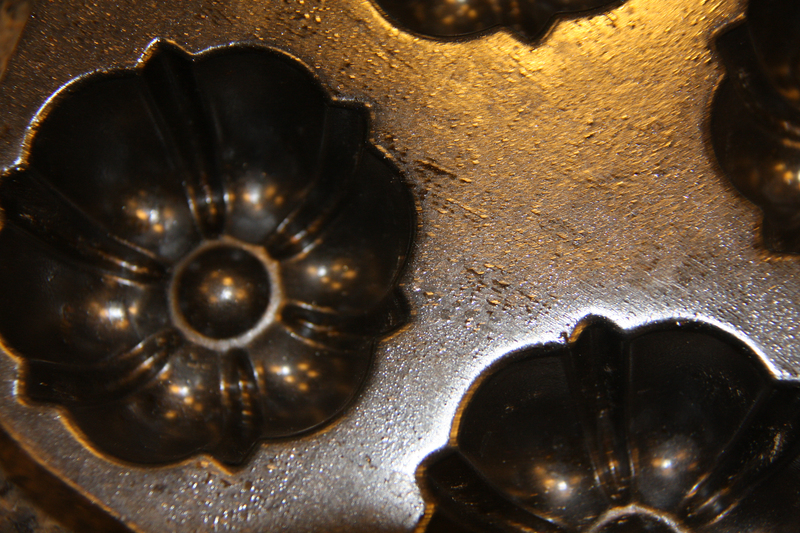 Turn the pan 180˚ halfway through the bake time. 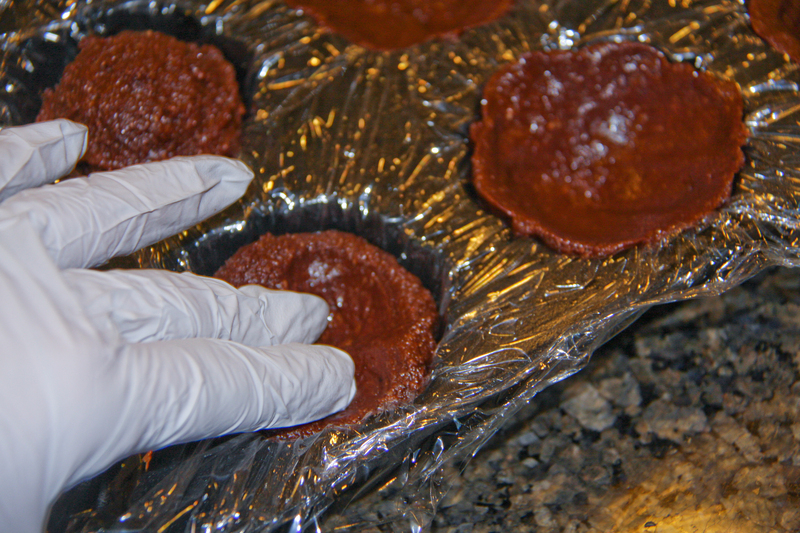 Once they are nice and brown and the middle of the muffin is set, remove from the oven. Let the muffins rest for 5 minutes and then transfer them to cooling racks. It is very important to allow the muffins to cool so they firm/set-up. 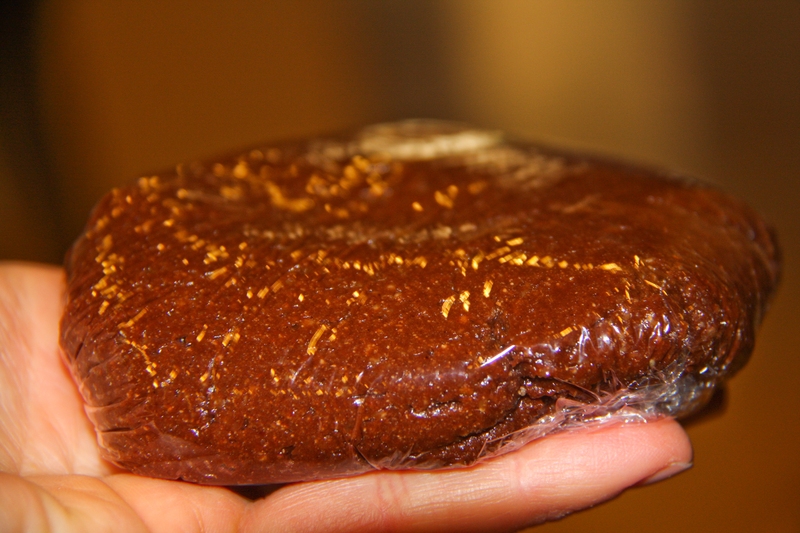 The texture of the muffin won’t be at its best until it is room temperature (not that my kids ever wait that long). 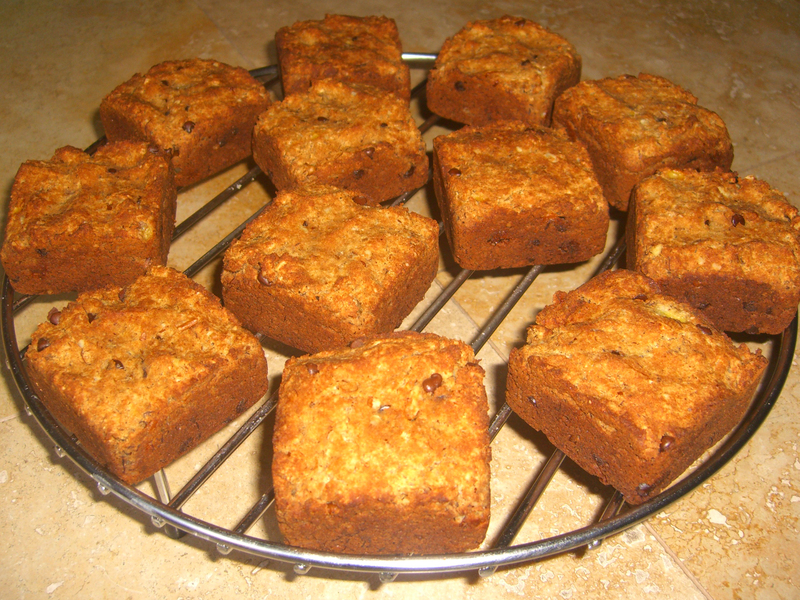 Once they have cooled enjoy!